For all skin types – especially oily and blemished. This set contains my best-sellers focusing on fresh and citrus scents. 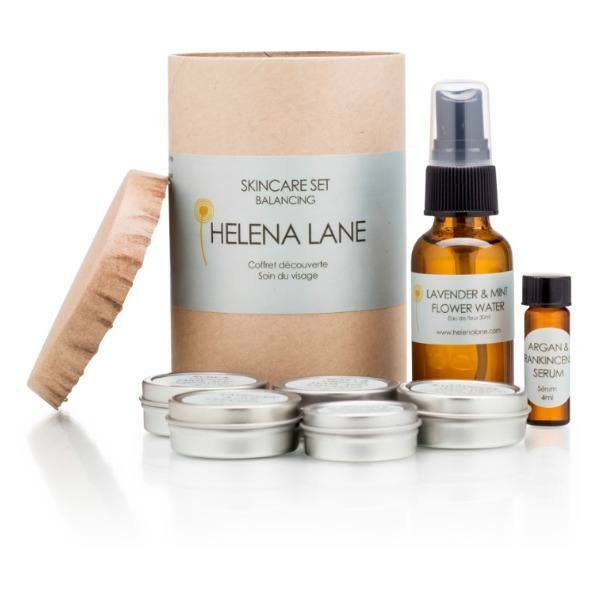 A wonderful introduction to Helena Lane Skincare. I was very pleased with this little package to sample the skincare. I love the fresh scent of it all and it is very gentle on my skin. My skin has been looking and feeling great! I’m extremely happy with these products! I’m 33 and still have frequent acne breakouts (despite a very clean diet and lifestyle). I’ve only been using the products a couple weeks and I already see a noticeable difference in my skin (and have had others comment on it). This is the FIRST skincare line I have used (and trust me…I’ve tried a lot…) that does NOT dry my skin out and it is the FIRST time in my entire life that I actually have skin that looks healthy and hydrated! I am SO happy these products exist! Thank you! I am so happy that I bought this set. At the time I was going through a really, really rough time with my skin. It was finally clearing up from about a year of really intense cystic hormonal acne so I had lots of scaring and congestion. Within about a week I noticed an incredible difference in my skin. The texture evened out dramatically, my scars began to fade noticeable, and I had way fewer breakouts. I haven’t had a serious breakout since I started using Helena’s products and for that I am so grateful. This kit also has incredible value–it took me over a month to finish the products. You need so little because everything is so concentrated. I reordered everything in the kit and am hooked! I can’t imagine ever using a different skin care line. Helena’s products deliver! Love this set. I started out qith seriously blemished, hormomal skin being 2 months postpartum, and ny skin has cleared right up with these products. I am no stranger to oik cleansing (I usually make my own) but this is much more luxurious. I love the cleanser, it smells amazing! The serum and moisturizer absorb super quickly. And of course, as it states, a little goes a long way. The packaging says this will last 2-3 weeks, but I’d put it more at 4-6 weeks! Just ordered a full size cleanser and moisturizer. Thank you! !